The NHS is required to improve productivity by 20%. The NHS needs to work collaboratively with its suppliers. 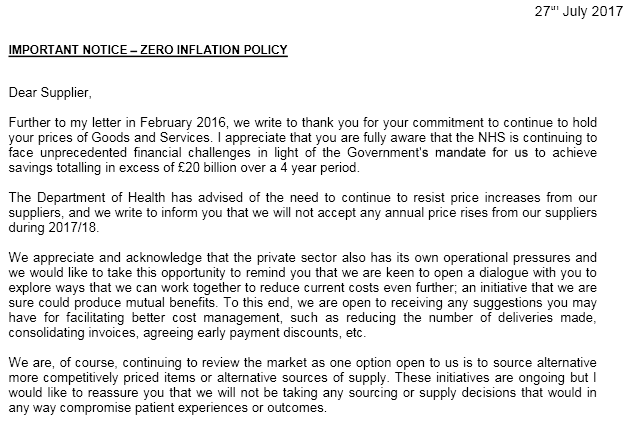 The NHS would like to learn the “secrets” from its suppliers. And then a thinly-veiled threat. A 20% productivity improvement has never been achieved before using a Cost Improvement Program (CIP) approach … so how will it now? A 20% productivity improvement requires something a lot more radical than a “zero-inflation policy”. A 20% productivity improvement requires wholesale system redesign. And there is good news … that is possible … and the not-so-good news is that the NHS will need to learn how to do it, for itself. One barrier to doing this is disbelief that it is possible. Another is ignorance of how to do it. If the NHS wants to survive, in anything like its current form, then it will need to grasp that nettle/opportunity … and to engage in wholesale raising of awareness of what is possible and how to achieve it. And there is one way to experience what is possible and how to achieve it … and it can be accessed here. … and follow the footsteps of the courageous innovators.